Your cemetery may require that the memorial placed on the grave be made of bronze. If that is your situation, please stop by our office to select from an extensive collection of unique designs. 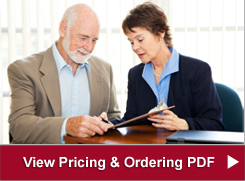 If you have a question about ordering bronze marker, click on one of the 3 links below to get a question answered, request an estimate or request that a brochure be mailed to you. If there is an existing marker on the lot and you would like to duplicate it, we can take care of that for you as well. Perhaps your father or husband was in the military and received a bronze memorial from the government and now you would like to prearrange a matching marker for yourself or purchase a matching marker for your mother. We can take care of these needs for you as well. Just explain your situation to our staff and we'll take it from there. 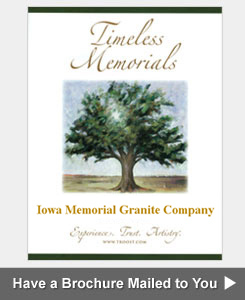 Just a few of the thousands of available bronze marker styles available at Iowa Memorial Granite Company are shown here. 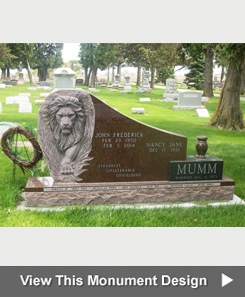 We offer bronze gravemarker choices found nowhere else.Visit our Muscatine, Iowa showroom to consult with us about creating a beautiful and meaningful bronze memorial for yourself or for your loved one. With affordable prices for our bronze markers, you will find we offer the most competitive prices in the eastern Iowa and western Illinois areas . 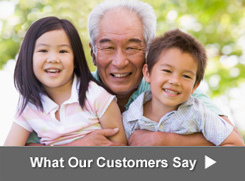 We deliver to ALL cemeteries, regardless of location, ownership or religious affiliation. We install VA bronze memorial plaques on granite bases and on granite monuments. Simply request that the veterans bronze headstone is shipped to us, rather than directly to the cemetery. The VA can help with all the needed paperwork. Or just call us at 563-263-5484 with any questions you have. Spouses of veterans deserve special treatment. We make the spouses marker to match the government-supplied memorial. Many times, the bronze memorials for the veteran and his or her spouse are installed side by side on a granite base. A flower vase is a popular option on this style of bronze memorial. Copper, the primary metal in bronze, commands a high price in the marketplace today. Because of this, it is not uncommon for bronze vases to be stolen from the cemetery for scrap. Should you need a replacement bronze vase, we can duplicate most every style and color. Just call us for assistance.